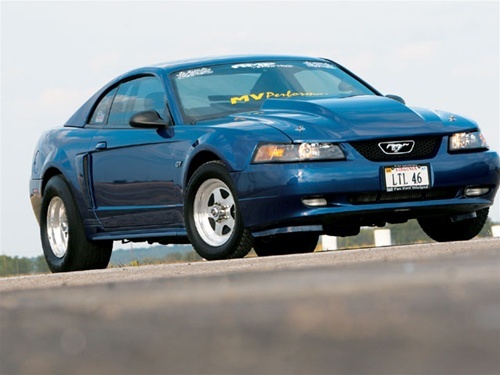 Stephen Posenau's '02 Mustang Sinks Those Who Try To Capsize It. What started out as a high-school addiction quickly became a life-long obsession for the electrician from Amelia, Virginia. "I had an '89 Mustang GT in high school, and I remembered how bad it was," Stephen says. "So when I saved enough money, I bought my '02 Sonic Blue Mustang GT. I started with small modifications like the exhaust, pulleys, and a cold-air kit. Eventually, things evolved to installing a ProCharger D1SC supercharger, but not long after I put on the blower, the bottom end let go." With the powerplant needing to go into the shipyard for repair, Stephen thought it was time to overhaul the Pony and turn his ocean liner into a destroyer. He turned to Tim Matherly of MV Performance (Statham, Georgia) for help. Tim put in a phone call to Mod Max, which shipped out a stroker kit for the Two-Valve that would boost displacement from 281 ci to 301. After Tim hung the H-beam rods topped with CP pistons on the stroker crank, he installed a main girdle and a Cobra oil pump before bolting on a brand-new Moroso oil pan. Keeping the boost contained in the cylinders are CP rings. While Mod Max took care of the short-block, Fox Lake Performance took care of the heads. After the crew at Fox Lake ported the stock two-valve heads, Tim finished them with a little touch-up machine work before assembling them with the stock valves that were now getting tickled by Crower camshafts. Compression was kept at a supercharger-friendly 8.5:1, and the top end of the mod mill was finished with the installation of a Fox Lake P51 intake manifold. The same D1SC blower was used, but with the bigger displacement, further improvement on the induction side of the powerplant was needed. A BBK mass air meter and 70mm throttle body flow the air, which is cleaned up by a K&N filter, into the combustion chambers, while a Boost-A-Pump, 60-pound injectors, and an Aeromotive fuel-pressure regulator infuse the go-juice. With the added cylinder pressure from the blower, a hopped-up ignition system was required, so on went an MSD ignition box to step up the output from the stock coil, distributor, and NGK plugs. There are no smokestacks on this vessel, just a pair of BBK 151/48-inch headers dumping into a 3-inch exhaust complete with a Bassani x pipe system and Flowmaster mufflers. The stock ECM was reflashed with a custom tune straight from the brainwaves of Matherly. Driving the juiced-up destroyer is easy thanks to the stock automatic. Giving the slushbox some extra help in handling the power are a B&M trans cooler, along with Performance Automatic's shift kit and 5,500-rpm converter. The stock driveshaft was swapped out for an aluminum item, and the factory shifter was ditched in favor of a Hurst piece.